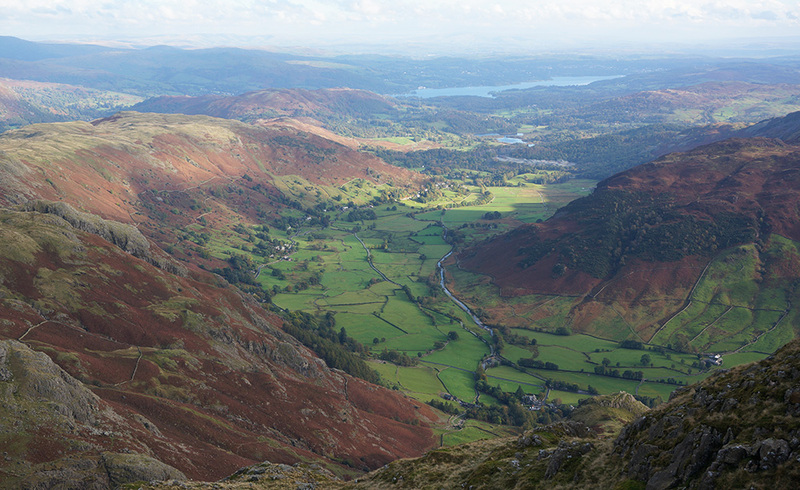 This time I stayed at Borrowdale YHA as this allowed me to complete one of my walks without having to jump in the car. It’s a relatively small and out-of-the-way hostel with a great atmosphere that might have something to do with the excellent bar and selection of beers. It’s also a popular weekend stopover and was completely full on the Saturday night, even the small camp site. Looking towards Codale Head from the stream close to Belles Knott. I have to admit that one of the attractions of travelling alone is the opportunity to “people-watch”. What kind of people travel long distances to stay overnight in places with only basic facilities in order to walk all day in “changeable” weather conditions? Well, clearly people like me but there’s more to it than that. In fact, people who do such things seem to fall into two distinct categories. Perhaps I should invent names for them but essentially, group one are young-ish (in their late 20’s and 30’s) and travel in couples or in friend groups of up to six. They tend to be characterised by what they wear. Naturally, they’re here for the great outdoors so they’re kitted out with the latest tech – stretch fabrics, headbands and hydration systems. To me they look a little like extras from a 1980’s aerobics video starring Olivia Newton-John but that probably says more about me than it does them. The second group are older (50’s and 60’s). They tend to travel alone or in organised walking groups (I met a very nice older lady from St. Albans who arrived ahead of her walking group) or occasionally in pairs (blokes only). Obviously, I belong to this second category and we tend to wear more traditional fabrics cut in less body-hugging styles and drink water from bottles. 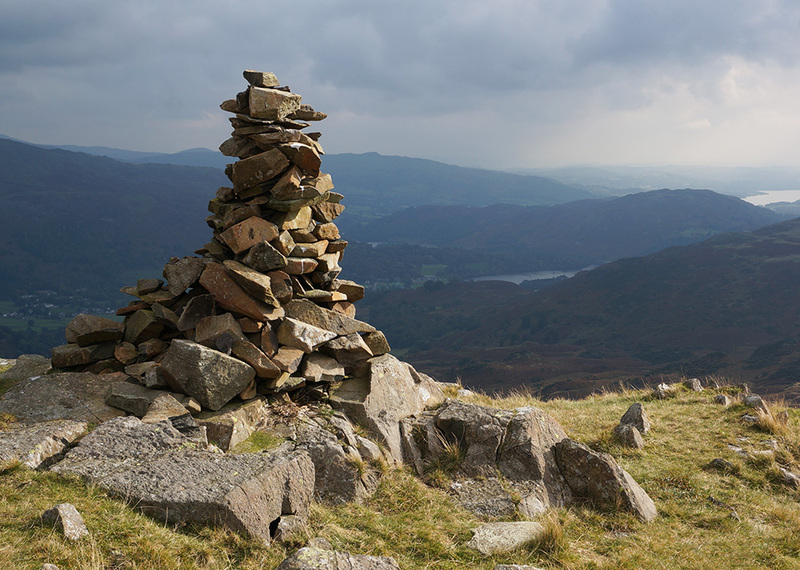 The viewpoint cairn at Tarn Crag looking towards Grasmere. Of course looking for tribal categories in any random group of individuals is just a bit of idle fun. 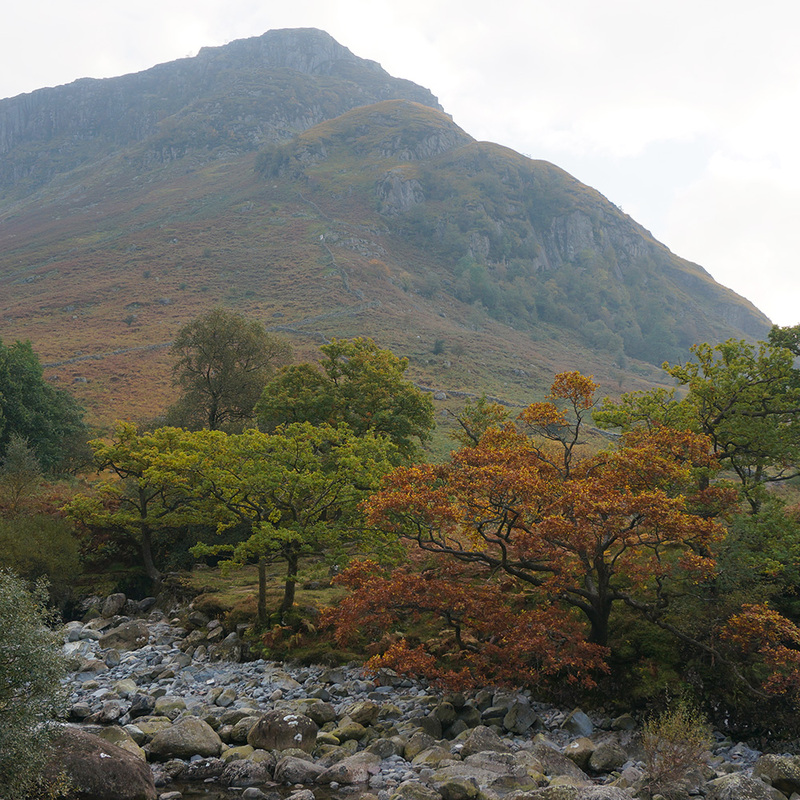 The most important thing is not the differences but the similarities and everyone staying at Borrowdale YHA last weekend had the same aim – to get out into the landscape and enjoy the autumn colours and smells and to hopefully feel the fading warmth of the year-end sun. Approaching Codale Tarn from Belles Knott. The forecast for the weekend was unsettled but I managed to complete all my planned walks with only a few light showers and some beautiful lightshows as cloud and sun intermingled. So I was prepared for some dramatic cloudscapes on my first walk of the weekend but I wasn’t prepared for the staggering beauty of Codale Tarn. The colours in the landscape were glorious. Bracken had turned to a burnt-orange brown and the grasses a pale straw. 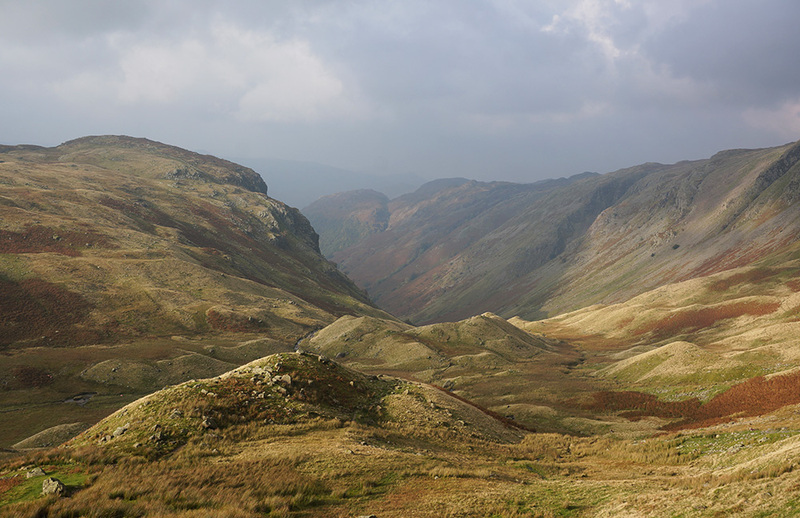 As I rounded Belles Knott en route to Tarn Crag and entered a natural amphitheatre, the sun broke through cloud and illuminated the scene – it was like walking into a painting. 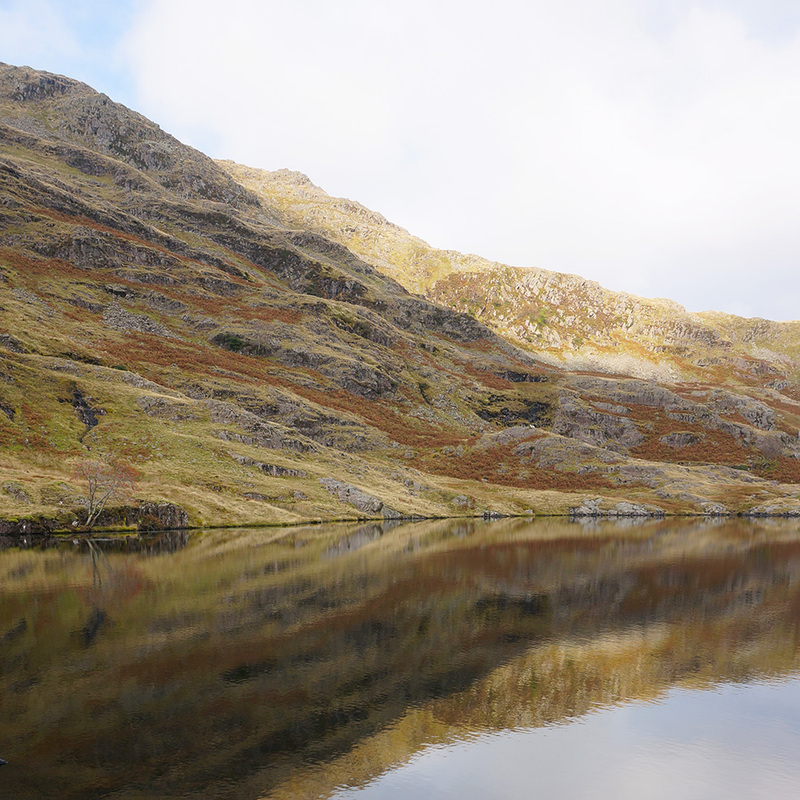 The still waters of the tarn reflected chevrons formed by diagonal bands of vegetation and I had no option but to spend longer than planned with my camera, trying (and mostly failing) to capture the spirit of that place. I was totally alone, there was no sound and I felt I’d found my place in the world – truly an antidote to the shoulder-to-shoulder standing crush of the Jubilee Line. 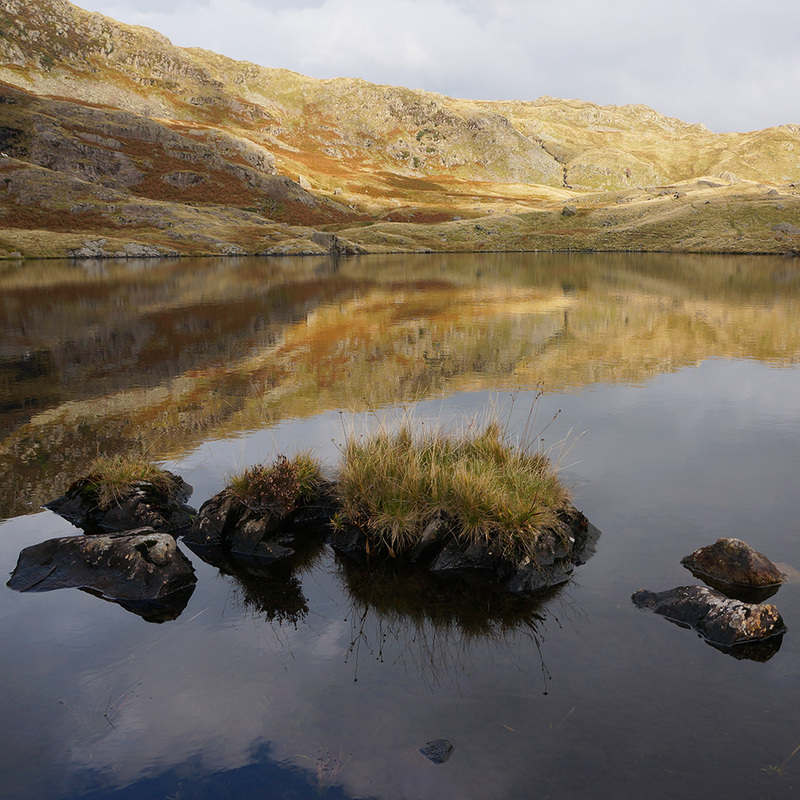 Rocks on the still waters of Codale Tarn. After such an experience, you might imagine that the rest of the weekend would pale in comparison but as I now know from experience, the Lake District is capable of providing tremendous highs and self-questioning lows, both within the same walk and so it was with my next outing. Chevrons created by the reflection of sloping bands of rock and vegetation. I set out from Borrowdale YHA on a cool and slightly murky morning hoping to take in 3 Wainwrights and following a walk from the excellent WalkLakes.co.uk website. This walk, I knew, would provide a wide variety of experiences. 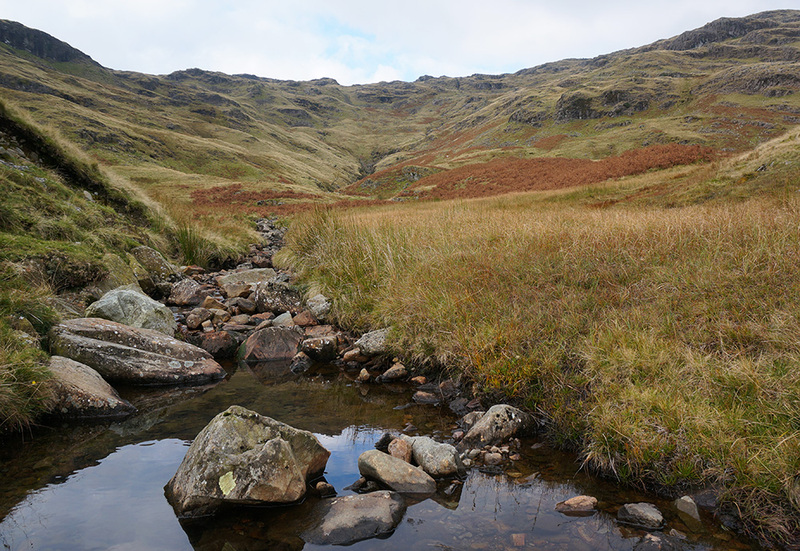 I was headed for the intimidating form of Eagle Crag, on to Sergeant’s Crag and then around the valley head and up onto Ullscarf – a good walk across a contrasting mixture of steep, rocky scrambles and open, boggy fell. However, I knew the ultimate destination of this walk was not going to provide the same spiritual highs as Codale Tarn. Wainwright describes the summit of Ullscarf as follows: “The top of Ullscarf is a cheerless place, even in sunshine; in storm there is no vestige of shelter. All is grass on this vast summit, and the only adornments are a cairn and a line of forlorn fence posts…”. Hmm, sounds like exactly the place to be on a cold and misty day with rain threatening. 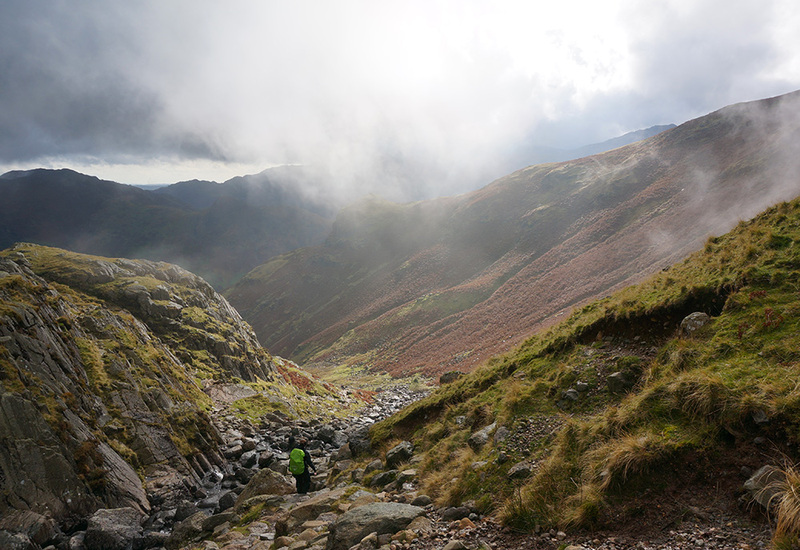 I put those thoughts to the back of my mind and started the steep climb up onto Eagle Crag. The imposing form of Eagle Crag from Greenup Gill. It was a tough climb and difficult in places but I eventually reached the top two hours after leaving the hostel. 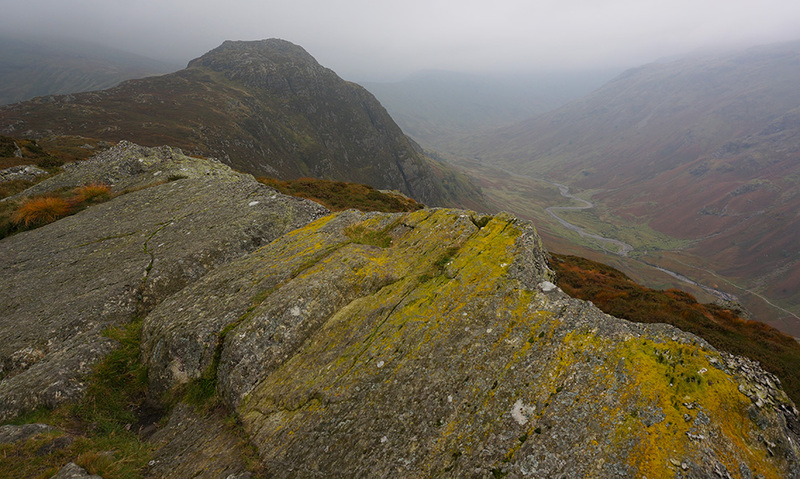 The weather grew greyer and mistier but the forecast for the afternoon had been for better weather, so I pressed on to Sergeant’s Crag, a relatively easy jaunt, reaching the top less that half an hour later. 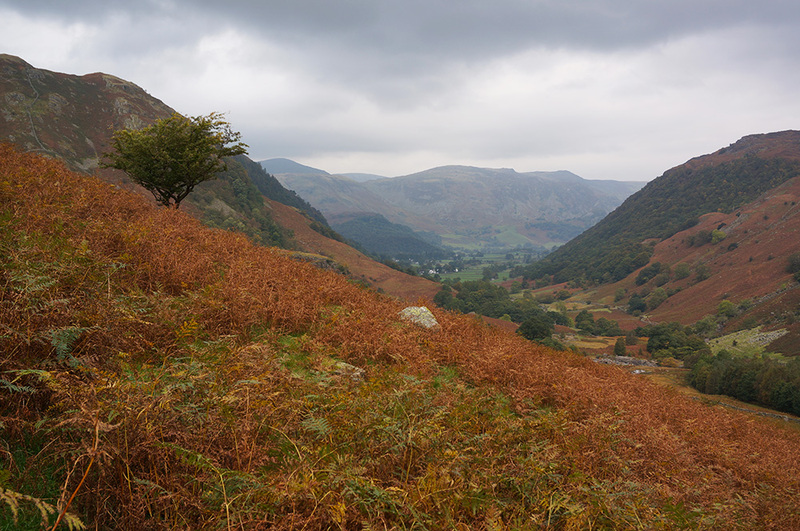 Looking back to Borrowdale from the lower slopes of Eagle Crag. At this point, with the weather still worsening (it had begun to rain) I wondered if it would be sensible to bail out but I couldn’t bear the thought of having to return on another day just to bag a “cheerless” summit, so I pressed on across open fell (no path), around the head of the valley and under Long Crag hoping to meet up with the Coast to Coast bridleway. Eventually, I came upon the bridleway and followed it up to the junction with the High Rise ridge path on Greenup Edge. Now mist was thickening, reducing visibility to less than 200m at times but it was moving fast and I decided to break for an early lunch, hoping that, given time, conditions would improve. They didn’t, and after lunch I had to decide whether to take the easy way out and return to Rosthwaite on the Coast to Coast path or to head off across two kilometres of open, boggy and misty fell. Naturally, I decided on the latter course of action. I knew that if I could find the old fenceline, I could use the intermittent steel fenceposts as a guide that would take me to the Ullscarf summit. So I set off, making sure to take a mental note of all the features I could easily identify so that I would be able to find my way back. In fact, it turned out not to be so difficult as I had imagined. There were just enough fenceposts remaining and just enough of a faint path to follow. Of course I always carry a compass, map and the GPS on my phone so there was no real chance of getting lost but it’s a whole lot more comforting when you can clearly see the way ahead and don’t have to rely on such tools. 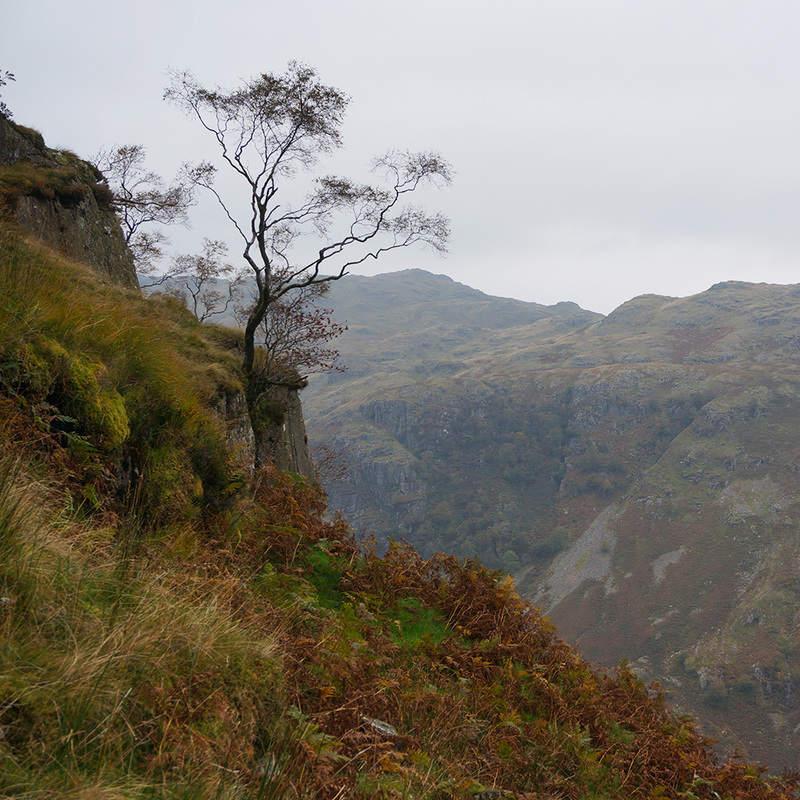 A tree on the steep slopes of Eagle Crag. 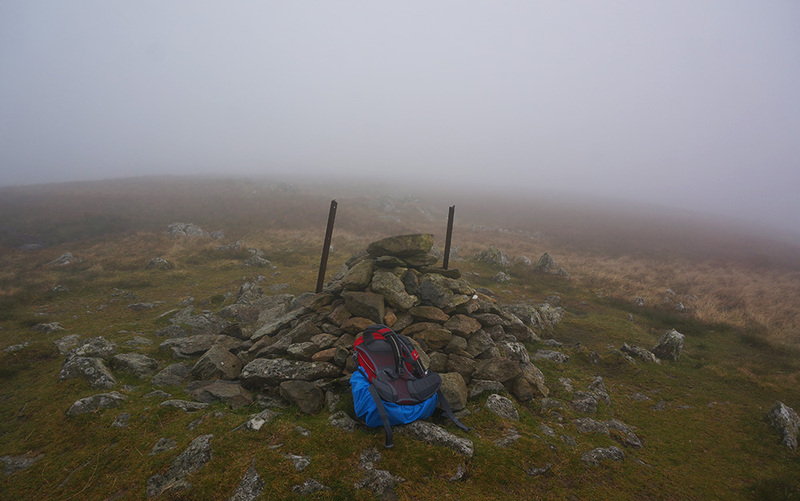 I reached the rather dreary summit (Wainwright was correct) and, of course, in mist there were no views as a reward. I spent maybe a couple of minutes there and retraced my steps. Sergeant’s Crag from the sloping rock summit of Eagle Crag. As is often the case on such days, by the time I rejoined the Coast to Coast path, the sky had begun to brighten and the mist disperse and as I dropped down towards Lining Crag, there were some great views of glacial moraines in the valley bottom as the sun played over their hummocky forms. The summit cairn at Ullscarf in mist. Save for the steep gully descent at Lining Crag, the return walk was unremarkable but very pleasant in the low, afternoon sun and the stretch along Greenup Gill is quite beautiful. Walking along river courses accompanied by the sound of running and falling water is a real treat. Sun-lit moraines in the upper Greenup valley. Having ticked off Tarn Crag, Eagle Crag, Sergeant’s Crag and Ullscarf on this visit, I had just one remaining Wainwright to bag in order to complete the Central Fells; Thunacar Knott. My daughter, Tilly and I had visited the Langdale Pikes in August but that walk had been spoiled when a thick mist rolled in, reducing visibility to around 50m. I know we must have passed within a couple of hundred metres of the summit on that walk but we didn’t even try to find it in the mist. So here I was, back in the Langdale Pikes to finish the business we started in August. 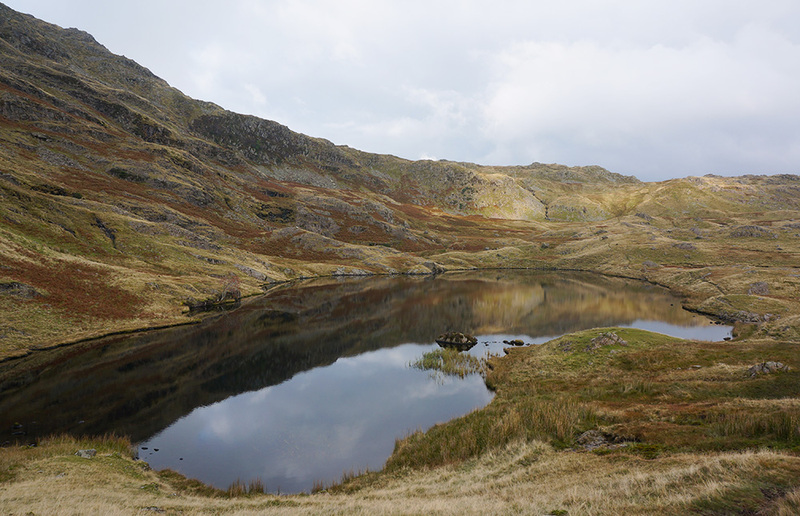 On this occasion I started from the National Trust car park at New Dungeon Ghyll and climbed the steep path to Stickle Tarn. The day had started wet but was now just overcast and there were surprisingly few people about given the popularity of this part of the Lakes. On reaching the tarn I headed north along the shore and then following Bright Beck before turning off west onto the steep climb to Pavey Ark. This is definitely a scramble and not a walk; Wainwright refers to it as “North Rake” – it’s steep and rocky but great fun. Looking back down Stickle Ghyll on the way to Stickle Tarn. At the top of North Rake, I decided to by-pass Pavey Ark summit and head straight for Thunacar Knott, now clear and unmistakable. I was eager to complete this section of fells and to take advantage of the sunshine which was now illuminating the whole plateau. It was only a short walk across to the two summit cairns (curiously, the slightly lower north top is considered the true summit but the south top clearly has a better claim and a better aspect). 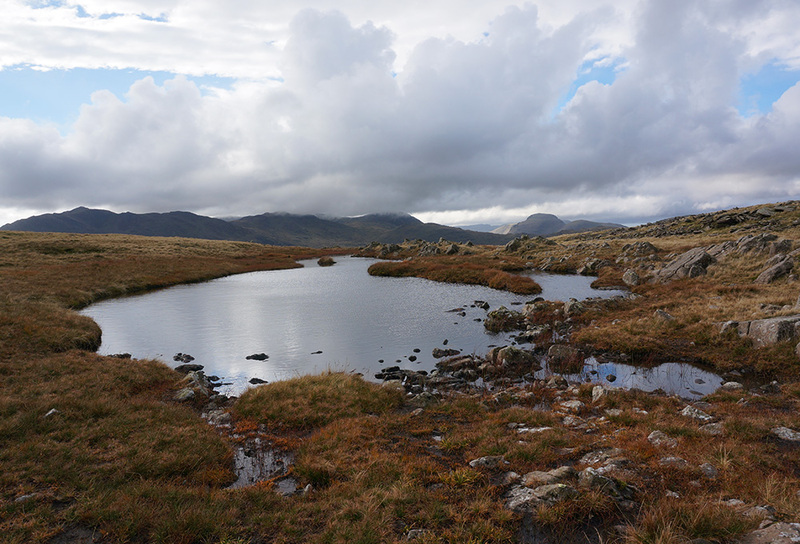 The tarn between north and south summits on Thunacar Knotts. This had been a very quick ascent and I was feeling pretty pleased with myself for climbing from car park to summit (a height gain of 630m) in just 90 minutes. There has been a marked improvement in my physical fitness since beginning this challenge and the benefits extend well beyond the psychological. Great Langdale from the summit of Harrison Stickle with Windemere in the distance. On the way back I rewarded myself with another trip to the summit of Harrison Stickle, the highest of the Langdale Pikes at 736m and possibly my favourite fell; its distinctive profile and amusing name make it a real character. I can remember seeing it from a distance on one of my early trips to the Lakes and thinking, “wow, what’s that?”. Having completed the Central Fells, I felt I’d achieved what I’d set out to do on this trip but there was still time to take in a few low outliers from the Far Eastern Fells. So, on the way home, I stopped at St. Peter’s church above Howtown on Ullswater and set off for the summit of Steel Knotts, known as Pikeawassa. This was a steep but relatively easy climb and other than the few rain showers, was a nice start to the day. At the summit I met a chap who was on his way to Loadpot Hill. He’d somehow managed to miss this Wainwright on previous walks and was aiming to put it right. He commiserated with me for having to return to work (he was retired) and I wished him good luck with the weather. We departed the summit in opposite directions. 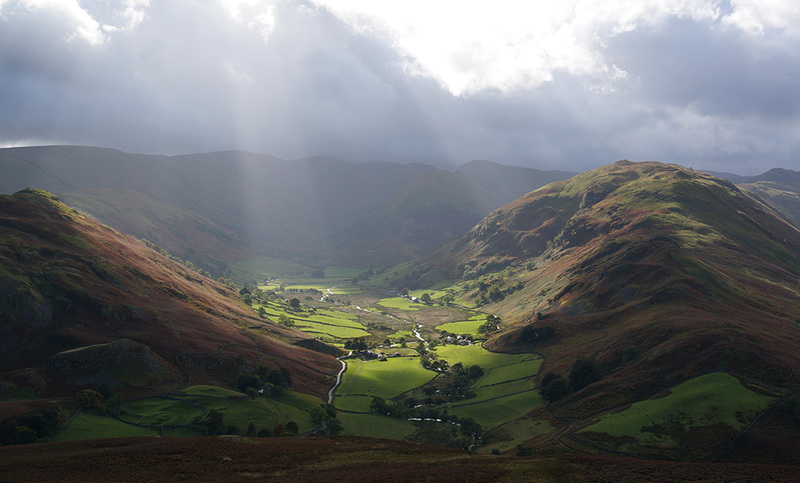 A beautiful lightshow over Martindale as seen from Hallin Fell. I headed back to the church and thought I might still have time to bag Hallin Fell. As it happens, the walk to Hallin Fell summit is clear, quick and relatively easy. I think I managed it in 20 minutes, just in time to witness a fantastic light show over Martindale and Boredale as the sun broke through rolling clouds; a really fantastic end to a successful trip. 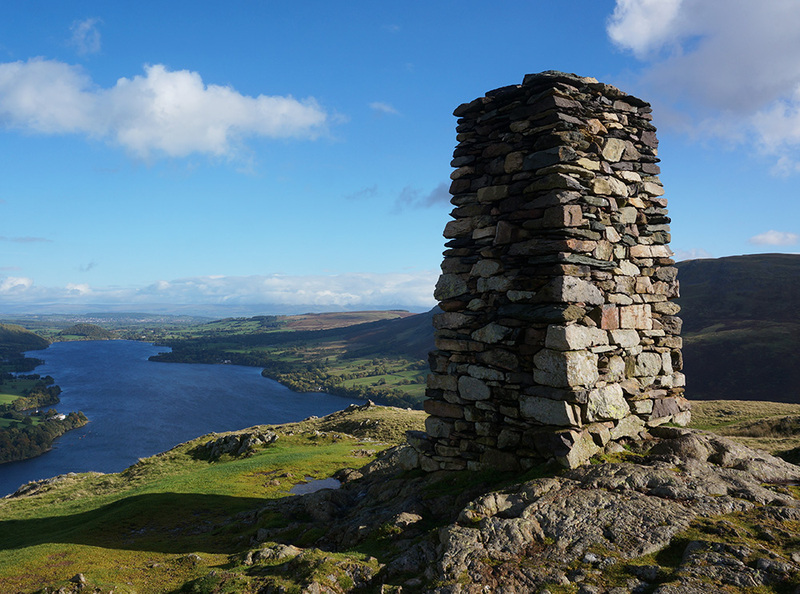 The tower cairn at the summit of Hallin Fell with Ullswater below. That completes 66 Wainwrights, 30% of the total and leaving just 148 more. I returned to my Sony NEX-6 camera on this trip and felt much happier. Obviously, I’m still hankering after that lens but the camera is just about perfect for this sort of work. I tried out a pair of Rohan Troggings (horrible name), which I recently got in the sale. Brilliant walking trousers that I’ll definitely be using again. At full price, they’re way too expensive for what they are but the performance is excellent. If only they had double side pockets like the Craghopper Kiwi’s, they’d be perfect – although there is something to be said for the simplicity of their design. The only other new piece of kit I took with me this time was a 750ml CamelBak Chute, a kind of glorified drinking bottle but really well designed and a delight to use.